FULTON, NY – NRG recently presented a check to Oswego County Opportunities, Inc. in support of the agency’s annual bowling tournament fundraiser, according to Diane Cooper-Currier, executive director at OCO. “We’re proud to announce that NRG is a ‘Building Dreams’ sponsor for our 2012 OCO Bowl O’Gold,” Cooper-Currier stated. 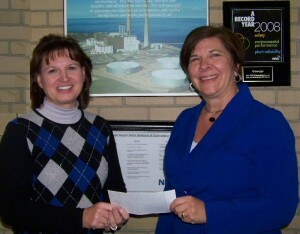 Diane Cooper-Currier (right), executive director of Oswego County Opportunities, receives a “Building Dreams” sponsorship from NRG regional administrative assistant Donna Moonan. The company will be sending two bowling teams to participate in the March10 fund raiser at Lakeview Lanes in Fulton. OCO chose the theme, “Bowl O’Gold” because this year’s tournament is so close to St. Patrick’s Day. Activities take place March 10, starting at noon with the first tier of bowling. There will be door prize drawings, raffles, a silent auction, as well as activities in the adjacent banquet room. The second tier of bowling begins at 3 p.m. Registration is now open. Five-person teams can sign up and request the tier of their choice, first come first served, now through Feb. 24. Cost is $15 per person. Oswego County Opportunities has been serving Oswego County since 1966 with programs that include: crisis assistance and counseling; health care; nutritional program such as Meals on Wheels and WIC; educational services including Head Start and after-school programs; residential services for youth, the homeless and developmentally disabled and mentally ill adults; outreach; transportation; and job training.